As Photo of the Day editor at NCPR, I get a unique, if skewed look at the North Country. Skewed by the predilections of our contributors, I mean–for beautiful landscapes, colorful fauna and flora, for the outdoor life and children and pets–all the things that become the jewels in family photo albums. Nothing wrong with that–I have an eye for the pretty shot myself. But just as a family photo album shows a sanitized version of family life, so the Photo of the Day shows a North Country absent many of its dimensions, and most notably rare–the picture that tells a story. 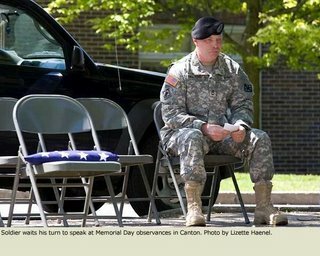 Which is why I get excited when I receive a contribution that perfectly captures a narrative, such as Lizette Haenel’s portrait of a soldier at Monday’s Memorial Day observance in Canton. I received many from that event– flags and formations and wreaths and salutes. But Lizette’s soldier is seated by himself in a section of folding chairs, deep in thought. His only neighbor is a neatly folded flag. You can tell he is about to get up and address the crowd–his notes are held in both hands. But his gaze is not toward the paper, rather he looks into that middle distance where memory resides. The picture tells you everything that he will say. It’s hard to say what makes a great photo. If it can hang on your bedroom wall for years without vanishing into the wallpaper, and without becoming an annoyance, that’s a clue. The one on my wall is a close-up of a single pine spray, spiky below, but soft on top with new snow. I’ve seen similar, but this has nothing but the essence–sprig, snow, nothing else. Deepest green, purest white. The focus is sharp, the way one can see the sharp edge of distant mountains though the clear lens of icy air. It looks cold, without making me feel cold–perhaps because I usually contemplate it from under the comforter, while sipping morning coffee. I can smell the clean pine scent above the springwater tang of winter wind, but I don’t need to burden myself with a parka or clown-walk back toward the river on snowshoes. And that’s a blessing for one whose ageing bones prefer to have a good thaw shovel the walk, and likes best to watch the whipping wind through a double-glazed window. Looks picture perfect. Think I’ll get some more coffee.